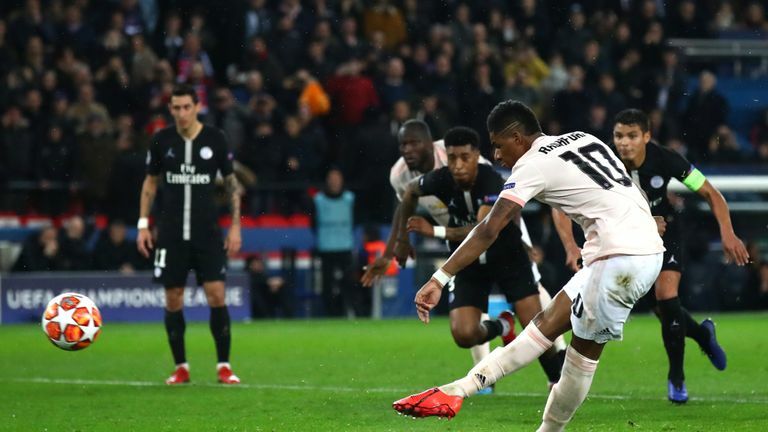 UEFA has issued an explanation for the late penalty awarded for handball which helped Manchester United progress past Paris Saint-Germain in the Champions League. Referee Damir Skomina was alerted by the video assistant referee under the 'serious missed incident' VAR protocol late on in United's last-16 second-leg tie in Paris. After viewing replays, UEFA said the referee awarded the spot-kick against PSG defender Presnel Kimpembe because "his arm was not close to his body" when Diogo Dalot's shot struck it. "Following the on-field review, the referee confirmed that the distance that the ball travelled was not short and the impact could therefore not be unexpected," a UEFA statement said. Marcus Rashford scored the penalty to take United through to the quarter-finals on away goals. Guidance from UEFA referee's chief Roberto Rosetti appeared to be consistent with Skomina's decision, as he advised officials in January that "if the defender is making the body bigger to block the ball it is not fair". Football's law-making body the International Football Association Board (IFAB) moved to clarify the interpretation of handball at its annual general meeting last weekend.